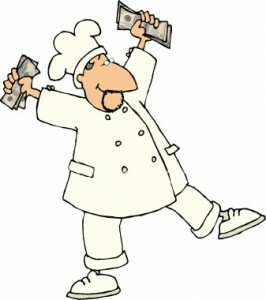 In a list compiled earlier this week by The Daily Meal, the 25 most successful chefs in America were compiled based on "Experian, the Orbis International Financial Database, BookScan, net worth rankings and previous salary estimates from Forbes and the Wall Street Journal, press stories, and savvy restaurant pros." So the list isn't anything "official" per se, but who knows? They might be right on the money (no pun intended). 5) Paula Deen. This Southern cooking personality comes in with an estimated $9.13 million in book sales, two Food Network shows, and multiple food tours with her husband and two sons. 4) Joel Robuchon. Named "The Chef of the 20th Century," Robuchon has more Michelin stars than any other chef (currently at 26). His restaurant empire stretches from America to Asia with 20 establishments, and his 16 cookbooks and multiple European TV shows continue to raise his popularity -- and income. 3) Alain Ducasse. As both chef and restaurateur, Ducasse reigns in a yearly income of over $80 million via his Michelin-starred restaurants, cookbooks, and a Parisian culinary school. 2) Jamie Oliver. He's well known these days for his Emmy-winning series Jamie Oliver's Food Revolution as well as his 20 restaurants, best-selling cookbooks, and former alias as The Naked Chef. Oliver's net worth was reported this year at $172 million. 1) Wolfgang Puck. His Wolfgang Puck Worldwide enterprise, which handles the Wolfgang Puck Express casual dining chain as well as all Wolfgang Puck food products, is estimated at over $400 million. Add to that 21 gourmet establishments, a kitchen cookware line, and multiple appearances in television and film, and the winner is clear.